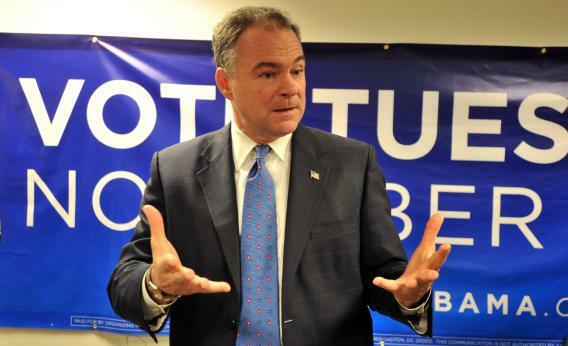 Tim Kaine: It's a Lie to Say That the 47 Percent Don't Understand the Cost of Government. On Saturday, I stood among the throng at a Tim Kaine for U.S. Senate rally in Sterling, Va., and heard a 20-minute stump speech heavy on talk of “compromise” and the rich superPAC donors who can add “a lot of zeroes to the checks.”* When Kaine referenced his last televised debate with George Allen, the crowd cheered. But I’d taken two whacks at Kaine for the way he answered a question at that debate, an odd response to the “47 percent” story. After the speech I asked Kaine why he said he was open to a “minimum income tax rate” for everybody. *Correction, Sept. 24, 2012: This post originally misspelled Sterling.